Supergirl #0 isn't really about Supergirl, though Kara is the focus of the issue. 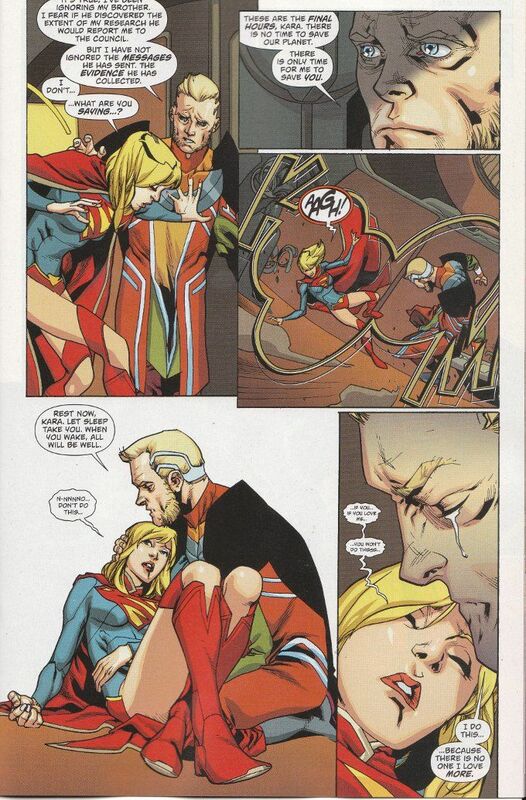 The story told here comes from the perspective of her father - Kryptonian scientist Zor-El. Apparently Zor is even less-respected than his brother Jor-El, thanks to his work in designing the living genetic weapons called World Killers. Nominally at work on a new shielding system that will protect his native Argo City from any outside disaster, he has also been performing experiments on his daughter that will ensure she will survive even if he fails to save his city from the upcoming apocalypse. Messrs Green and Johnson offer us more of an information dump than a character study with this issue. Still, it does still tell is a lot about Kara's father and life on Krypton before The End. There's signs of the old emotionless society, as Zor's relationship with his wife seems far less loving and protective than that with his daughter - an arranged marriage, perhaps? There's also some suggestion that the oddities of Kara's arrival on Earth - such as why she's more powerful than Superman in most respects and why she hasn't aged a day while he grew to adulthood- can be explained by the revelation that her father performed experiments on her. As always, Mahmud Asrar's art is amazing. Everything looks good, from his breath-taking backgrounds depicting the beauty of Krypton to his unique and detailed character and clothing designs. Truly Asrar is one of the most underrated talents at DC Comics today! If you continue to ignore my advice regarding this book and still haven't started reading it, now is the time to start. This issue is a wonderful jumping-on point for new readers while still offering a lot of nods and explanations for long-time readers. Apart from the odd appearance of what appears to be a time-traveling Superboy (which I have no explanation for) there's nothing here that should confuse new readers.